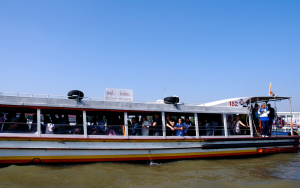 The Chao Phraya Express boat service is the main public boat transportation which runs up and down the Chao Phraya River through central Bangkok. 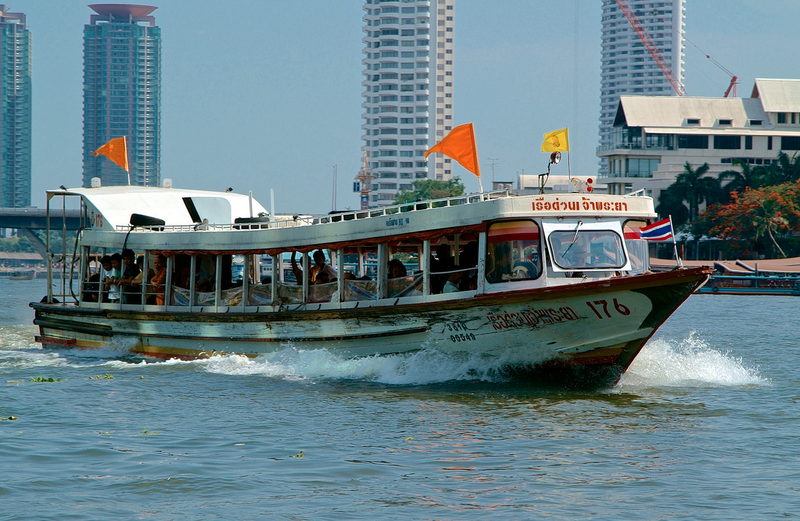 With traffic in the city often being horrendous the open river can make a speedy alternative to taking vehicular forms of transport on Bangkok’s horrendously congested roads, also many popular tourists sites are within a short walk of Chao Phraya express piers so this transportation should be consider as a cheap and speedy alternative if you are visiting some of these sights. 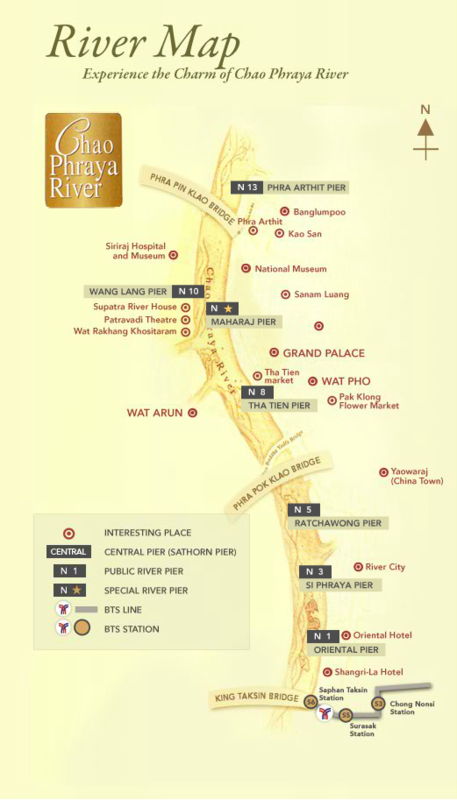 Taking the Chao Phraya express should just not be seen as a means of transport for getting from A to B as you will also get a free sightseeing tour of some of the famous Bangkok riverside sights. Iconic sites along the route include, Wat Arun (The Temple of Dawn) the chedi peaks and spires of the Grand Palace as well as the comings and goings of everyday life on the Chao Phraya River. The Chao Phray Express boat tourist service consists of 42 boat piers with the most northerly pier being Pakkret Pier and the most southerly pier being Ratburana Pier. You can buy a ticket on board and some boat piers will have a small ticket stand near to the pier, however it is not necessary to buy your ticket beforehand (also be careful about being sold a tourist boat service if you want to travel on the public service….more about this later in the post!) The boats are around 20 meters in length and consist of one lower seating deck, when seats are full passengers can stand in the central isle and towards the back of the boat. before getting on the boat you will need to establish your orientation and and decide whether your destination stop is up or down river, you should easily be able to tell by the flow of the water which is usually quite strong on this stretch of the river. All you need to do is wait for the boat to arrive and hop on once the pilot has secured the rear of the boat against the pier (check the colour of flag on top of the boat matches your required route – see below for route map) you will need to be quick here as the boat will only be mored for around 30 seconds before it is on its way again. It is useful to have a map with the piers market so you can gauge when your destination pier is approaching, also at busy times make sure you approach the back of the boat well before you reach your destination pier so you are ready to get off. If you have not purchased your ticket in advance a ticket collector will circulate on the boat, just shout out your destination pier and the ticket collector will collect the fare and issue the ticket. Fares are cheap, especially on the public service and range from 10-32 baht depending on the boat and which stop u require. 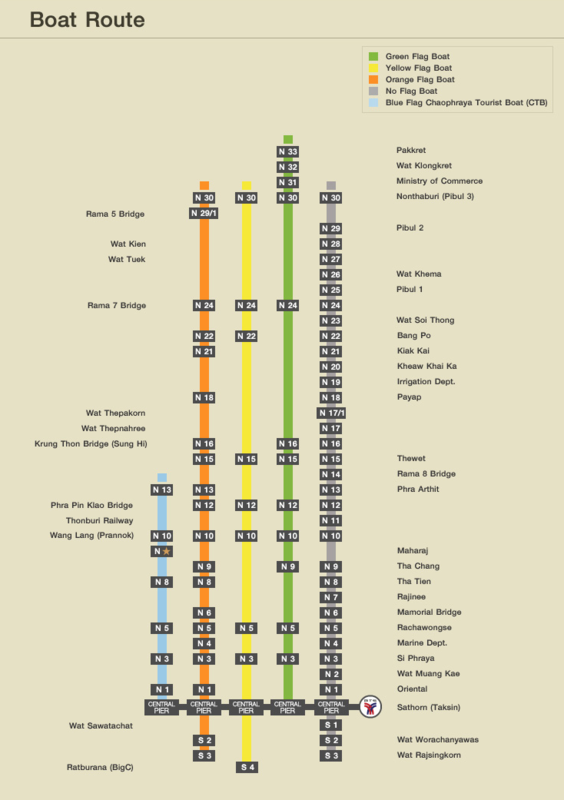 Chao Phraya Express boat service route map – To determine the route each boat operates on look out for the coloured flag on top of the boat this will indicate its route. Not all boats stop at every pier! Routes are colour coded. Boats display a coloured flag in accordance with their route colour, look for the flag on top of the boat. At most piers a route map should be displayed showing which colour route stops at which stop, make sure you choose the correct boat for your destination pier! A few years back a dedicated tourist service was introduced. 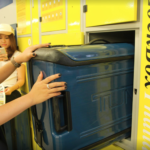 On the whole it is very similar to the usual public service and does not offer any extra comforts, although it tends to be less crowded than the public service. The tourist boat only stops at selected piers (piers convenient for popular tourist sites, other transport connections or proximity to tourist hotel areas such as Banglampoo and Khao sarn Road) the fare is a lot higher! and there is also a guide on every boat giving a running commentary on some of the sites you will pass while travelling up or down river. So should i use the tourist service? The only extra you are getting with the tourist service is the running commentary from the onboard guide, so it is a matter of personal choice whether you value this extra service or would prefer the public service without the commentary, I for one definitely prefer the public service as you are travelling with the locals and do find the loud crackling commentary over the microphone a little irritating. The tourist boat is more expensive than the normal public boat service at 40 baht per trip but there is a day pass option available for 150 baht, but still if you are using the public boat it is very unlikely that you will make enough trips in a day that will cost more than 150 baht (see fares below). The tourist boat does make an extra stop at Mararaj pier which the other routes do not stop. 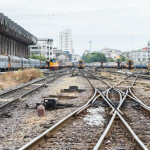 If you are staying in Bangkok for a few days and want to take some time making your own way around some of Bangkok’s famous tourist sites then taking the time to get on the Chao Phraya Express Boat is well worth the effort. 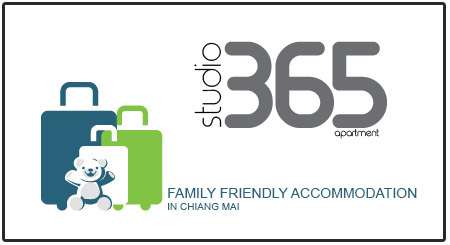 You will be rewarded with a great insight to Bangkok’s busy Chao Phraya River as well as a speedy method of travel through this otherwise congested city. My recommendation is to stick with the local boat rather than the tourist boat, its cheaper and you will find it a real and authentic experience.